The story of Three Brothers Restaurants is a first rate American success story. In 1976, three sons of a hard-working Italian family moved the family business from Brooklyn, New York to Greenbelt, Maryland to make good on their father’s dreams of success. After over 35 years of hard work, one family restaurant has grown into a thriving Multi-unit Corporation . Originally from Rapone, Italy, Michael, Mario and Peter Repole have participated in every part of the business – from using family recipes for making their famous sauce and entrees to developing both in-center and free standing Three Brothers Restaurants. The original Greenbelt, Maryland location is still a thriving operation, and remains the companies highest volume store. Many of its existing customers are children and grandchildren of people that have been served by Three Brothers Restaurants since the beginning. This reinforces the notion of family, which the company tries to create in its customers and employees. 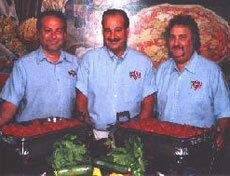 Please come and enjoy our family history and Great Italian/American Cuisine at a Three Brothers Location nearest you. Mangia Mangia!!!! !